From the publisher: Spring has come to charming North Harbor, Maine, and with the new season comes a new haul for Second Chance, the shop where Sarah Grayson sells lovingly refurbished and repurposed items. Sarah is turning her keen eye to the estate of collector Edison Hall, hoping for fabulous finds for Second Chance—but when her rescue cat Elvis discovers a body in the kitchen, everything goes paws up. The body belongs to an appraiser who had been hired to check out Edison’s wine collection. When Edison’s sister shows up at Second Chance, she hires Sarah’s friends—the kooky and charismatic trio of ladies who call themselves Charlotte’s Angels and work out of the shop—to solve the murder, Sarah knows she and Elvis are only going to get deeper into the case. But as it becomes a cat and mouse game of lies, cons, cheats, and family squabbles, can Elvis and Sarah claw their way to the truth before the killer slinks away forever? Tortie Shorties Review: Secondhand/repurposing shop owner Sarah Grayson and feline lie detector Elvis return for their third adventure in A Whisker of Trouble. Sarah has been hired to clear out the home of the late Edison Hall, a pack rat extraordinare. Edison's son has been planning to sell his father's extensive wine collection in order to pay for his wife's expensive back surgery, only to be told that Edison had been the victim of a wine scam: the bottles are fakes and therefore worthless. It's not long before Sarah and Elvis stumble upon the dead body of the appraiser hired to evaluate the wine collection in Edison's kitchen and end up embroiled in yet another mystery. I am absolutely crazy about this series. First, I love cozies set in Maine. It's one of my favorite settings. The cast of characters is phenomenal, particularly Sarah's elderly lady friends Liz, Rose, and Charlotte, (and of course Rose's computer hacking beau Mr. P.) who call their detective agency Charlotte's Angels, but also remind me of the Golden Girls. Sarah's love life is also getting complicated as she's torn between her feelings for her "jack of all trades" employee Mac and Charlotte's son Nick who is also an investigator for the medical examiner's office. Is the murder related to the wine scam? I found this mystery to be a real page-turner as I ended up finger-pointing the killer long before Sarah did...all because of Elvis! From the publisher: B and B owner Bea Cartwright has taken on the responsibility of taking meals to ten visiting nuns, who are on retreat at the Water’s Edge Center for Spirit and Renewal on picturesque South Bass Island on Lake Erie. But the peace of the retreat is shattered when one of the nuns is found at the water’s edge—murdered. And when a second nun is killed, Bea and the other members of the League of Literary Ladies—Chandra, Kate, and Luella—start to wonder about eerie parallels with the Agatha Christie mystery classic, And Then There Were None. Tortie Shorties Review: Agatha Christie would be so proud that she still inspires books such as this! This is the fourth in the League of Literary Ladies mystery series and it stars a cast of 10 nuns on a retreat at the Water’s Edge Center for Spirit and Renewal on South Bass Island. Bea has been asked to provide their meals since the kitchen isn't fully renovated yet. Shortly after they arrive one of the nuns goes missing and is later found floating face-down in the lake. When a second nun is found dead the Literary Ladies begin wondering if they are about to get picked off one by one just like in the classic mystery And Then There Were None. Since she's forming friendly relationships with them, Bea decides to chat up the nuns to see if she can uncover a motive among a group who supposedly barely knew each other. On top of the murders, Bea must deal with a bit of dissention between her friends Chandra, Luella and Kate, and just as her relationship with Levi heats up she learns some shocking news about him, and in turn we find out about her own secret past, and it's a doozy! I adored the retreat center setting. It's definitely a place I would enjoy visiting. And I also really liked the cast of nuns. Ten new characters might seem like a lot to keep track of but each was so unique that it wasn't difficult at all. The four central characters, who were forced to form a reluctant book club in the first book in the series (Mayhem at the Orient Express) have developed a very special friendship and I look forward to what's next for them. Disclosure: I received copies of these books from the publisher in exchange for a fair and honest review. These books sound amazing. 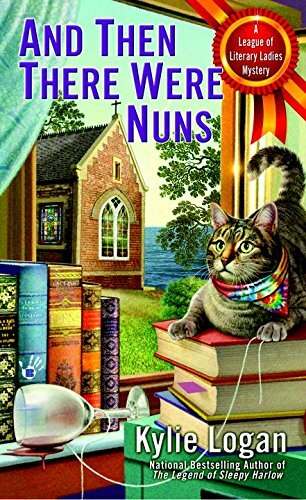 I am a fan of the League of Literary Ladies mystery series, and I have been looking forward to reading And Then There Were Nuns. 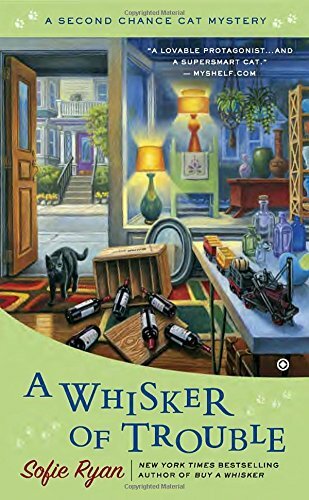 Thank you for your review of A Whisker of Trouble. I will have to read A Second Chance Cat Mystery series. Great review, Mudpie. If only I had the time to read more books!!! Two more great reviews, Melissa and Mudpie! These books sound like such fun reads, not to mention that their cover art is lovely. Purrs! Thank you for sharing these! I love little cozies, but I'm not very familiar with cat series ones, so I will be checking these ones out! The books sound as though they will be great to read - Mum is going to look out for them. The list of books our mom needs to read when she is done grad school keeps growing! Right now she's busy reading textbooks and journal articles and boring (to us, interesting to her) stuff like that. 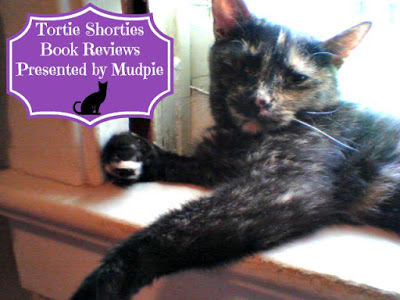 What a pawsum review Mudpie. Great reviews Miss Mudpie. The Nun one sounds really good. The mom's book list is getting longer and longer and longer!